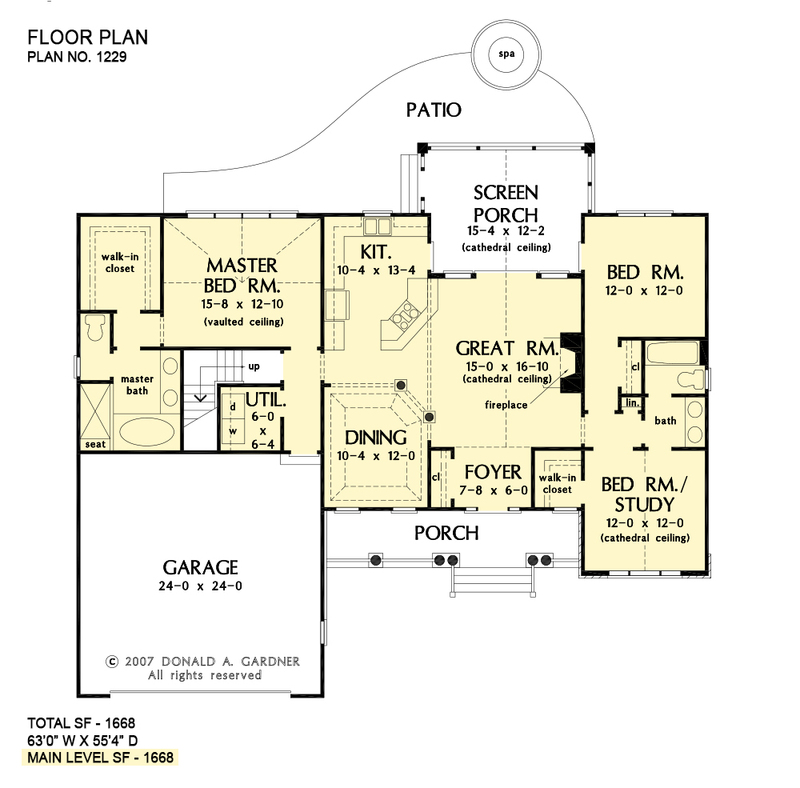 This one-story, split bedroom house plan design offers everything today's families need without wasted space. The Carrollton's stone and siding facade brings classic traditional style to any neighborhood. Inside, the kitchen, dining room and great room are wide open, creating a feeling of spaciousness. Angled columns in the dining room and an angled kitchen counter add visual interest to the space. In the great room, a cathedral ceiling adds even more volume. The private master suite features a cathedral ceiling, generous walk-in closet and a space-saving pocket door in the master bathroom. Two additional bedrooms share a hall bath. The spacious screened porch can be accessed through the kitchen, great room and one of the bedrooms. 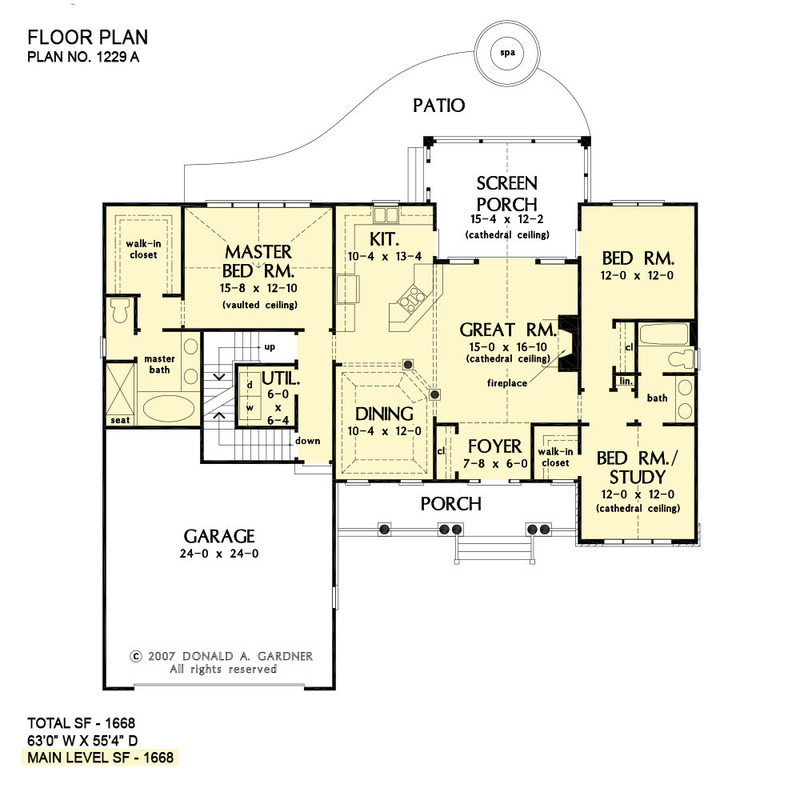 The house plan features bonus space over the garage which is the perfect location for a media room, hobby room or play room. 1st Floor: 1668 Sq. Ft. 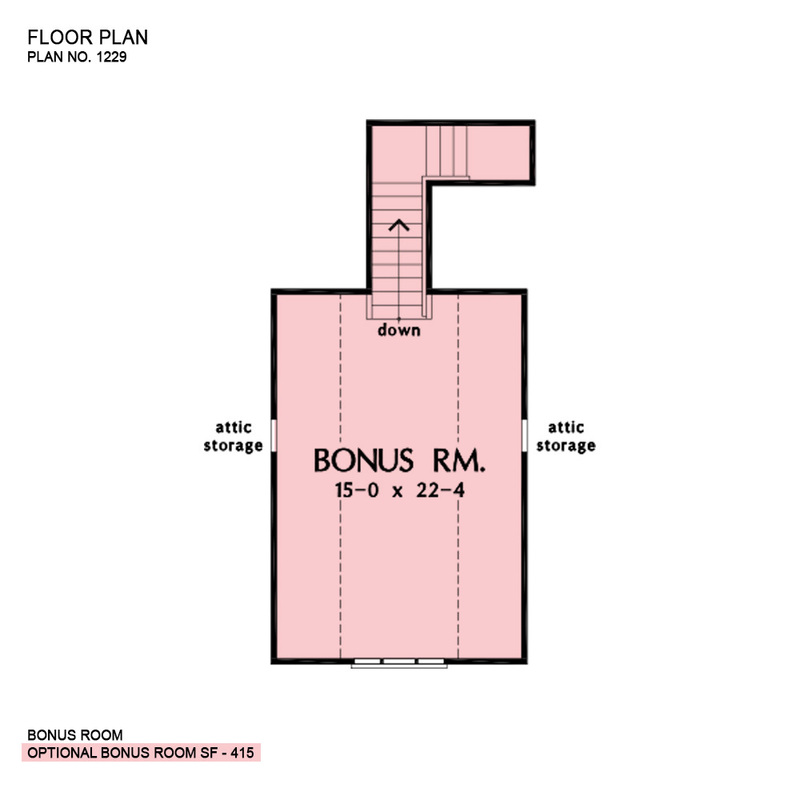 Bonus Room: 415 Sq. Ft.
House Dimensions: 63' 0" x 55' 4"
Great Room: 15' 0" x 17' 0"
Master Bedroom: 15' 8" x 12' 10"
Bedroom #3 : 12' 0" x 12' 0" x 9' 0"
Bedroom / Study (Cathedral): 12' 0" x 12' 0" x 13' 0"
Bonus Room : 15' 0" x 22' 4" x 8' 11"
Foyer : 7' 8" x 6' 0" x 9' 0"
Garage : 24' 0" x 24' 0" x 0' 0"
Great Room (Cathedral): 15' 0" x 17' 0" x 16' 6"
Kitchen : 10' 4" x 13' 4" x 9' 0"
Master Bedroom (Vaulted): 15' 8" x 12' 10" x 15' 0"
Porch - Front : 25' 8" x 5' 8" x 0' 0"
Porch - Screen (Cathedral): 15' 0" x 12' 2" x 16' 6"
Utility Room : 6' 0" x 6' 4" x 9' 0"